Value Doors manufacture and install high-quality uPVC Doors across the UK. Our stylish uPVC Doors combine functionality with visually pleasing designs and are extremely low maintenance. As the most cost-effective Front Door option, our uPVC Doors are ideal for all property types. We believe that a person’s Front Door provides valuable insight into their home’s unique character. That’s why our uPVC Doors are available in a wide range of designs and with different accessories. Featuring beautiful glass designs, our uPVC Door styles come in three different colours, White, Golden Oak and Rosewood. Whether you’re searching for a new uPVC Front Door or uPVC Back Door, Value Doors has a perfect uPVC style for you. All our uPVC Doors provide your home with added value and solid security. They include toughened safety glass as standard and comply with current building requirements. Giving you peace of mind that your uPVC Door will protect your home and family. For homeowners wanting further protection, you can upgrade your uPVC Door to a High-Security uPVC Door. Our uPVC Doors are also manufactured to improve your homes’ ability to retain heat. All our uPVC Doors come complete with double glazed glass and contain core materials that provide superb thermal efficiency. With a uPVC Door, your home is guaranteed to stay warm all year round. At Value Doors our uPVC Doors offer an outstanding value for money, as alongside your new door and frame, the prices of all our uPVC Doors includes VAT and installation fees. You’ll also be pleased to know that our uPVC Front Door styles come complete with a free ten-year insurance backed guarantee, giving you peace of mind that your new uPVC Door is built to last. Explore our entire range of uPVC Doors online and give us a call on 0800 955 0898 today. Value Doors are always happy to help! It doesn’t matter where you are in the UK, you can go down any street and find a White uPVC Door on any home and it looks great. Traditional, long-lasting and simplistic, White uPVC Doors combine their style, functionality and low maintenance to create a door that is loved by the British public. We pride ourselves on quality at Value Doors which is why when it comes to manufacturing our uPVC Front Doors we only use the best materials. Using the highest quality CE marked components ensures your new Front Door or Back Door and uPVC Windows are at the top of their game. Sticking with the best quality, at our head office in Leeds each separate component is pieced together to manufacture a Front Door that increases the security and thermal efficiency of your home. You don’t just buy a new External Front Door, you invest in a new Front Door, which is why we have gone to great lengths to ensure you get the perfect uPVC Door that’s right for you. Adding a personal touch has never been easier as we have over 170 different designs for you to choose from. As well as this we have numerous door accessories for you to really add your own touch and make your new external Front Door unique. Aside from uPVC Doors, we also manufacture uPVC Windows that would fit perfectly with your new Front Door and completely transform the look of your home. All of our uPVC Windows are double glazed and so increased thermal efficiency is ensured. For all of your uPVC Door or Window needs you are in the right place, at Value Doors we are a trusted door and window company, the nation's favourite. An added bonus is that with all of our uPVC Doors on our website, the prices include measuring, fitting and VAT. Not to mention, a free 10-year, insurance backed guarantee and we will dispose of your old door if you wish. To view our door accessories, click here to find a range of options for you to add to your new door. Yes, traditional White uPVC Doors look great, there is a reason why they are the most popular door. However, if you are looking for something different, whether it be a uPVC Front Door to match your windows or if you simply want to add a different colour to the exterior of your home, a uPVC Door in Golden Oak could be for you. With over 170 Oak uPVC Doors to view and the options of many gorgeous door accessories, we are certain you will find the perfect Front Door for you. Like with our Composite Door range, Oak uPVC Doors add something extra to your home, making it stand out from the crowd. Of course, security is a concern when considering getting a new Front Door which is why our uPVC Front Door range has a 6-point locking system, a 28mm thick panel and all doors comply with current building requirements. 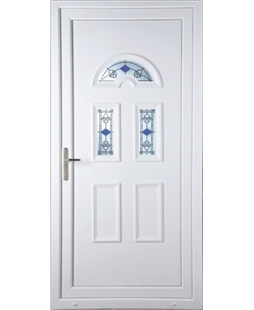 We do also have Oak uPVC Doors in our high-security uPVC Door range if you are wanting a door with added protection. Please note: Our Golden Oak uPVC Front Doors are available with Oak on both the inside and outside of your new door, or Oak on the external side of your door and White on the inside. You also have the option of whether you want a matching Oak frame or a White frame. The majority of external uPVC front Doors that you will see on houses are White, however here at Value Doors UK, we also offer front Rosewood uPVC Doors. These coloured uPVC doors are great if you want a front door that stands out from the crowd or matches your homes Rosewood windows. The durable PVC material that our doors and windows are manufactured from has been UV stabilised to create a virtually maintenance free door that is protected from discolouration. Not only does this mean that your door will be looking like new for years to come, but to keep your new uPVC Door clean it will only require a wipe down with a damp cloth. 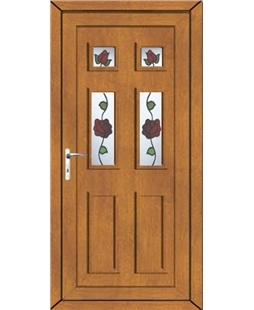 We have over 170 different Rosewood uPVC Door designs to view and choose from, as well as a range of door accessories, so no matter your style and front door needs, we guarantee we can create your perfect front door. Our uPVC Windows are also available to buy in Rosewood! 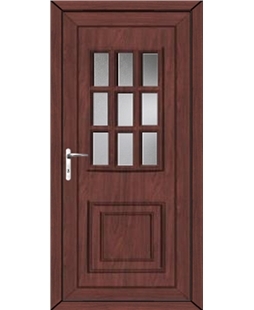 Please Note: Our Rosewood uPVC Doors are available with Rosewood on both the inside and outside of your new door; or Rosewood on the outside of the door and White on the inside. You also have the option of whether you want a matching Rosewood frame or a White frame.